PassPACES - your passport to PACES success! Welcome to PassPACES - your passport to PACES success! Our aim is to ensure that you Pass PACES first time! All PassPACES courses in 2013, 2014, 2015, 2016, 2017 and 2018 were fully booked !!! 'As one of eight doctors from Ipswich Hospital to attend the PassPACES Course, I just wanted to pass on my thanks for a fantastic course. The patients were amazing; not only having superb clinical signs, but also pointing us in the right direction should we be struggling! The clinical lecturers taught enthusiastically, with a good sense of humour; the mock exam and the way the lecturers responded during the mock was extremely relevant and useful for the actual exam. The feedback we were given during the course reflected the style of the exam marking system and was invaluable for improving any "weak" spots. I just want to say thank you so much for a fantastic course. I passed first time and was amazed and absolutely delighted to score 172/172! I definitely could not have achieved that mark without attending the course: the teaching was really outstanding and we were exposed to so many patients with such excellent signs. I expected that the course might feel rather intimidating but the lecturers were enthusiastic, supportive and provided very helpful feedback. The course gave me the confidence and the structure to approach more complex cases (particularly neurology) and 'work things out' in a logical way. Thank you for a really enjoyable and inspiring 4 days! I have already recommended the course to my colleagues and will continue to do so! ‘I would like to thank you for your excellent course. The high quality lectures I received and the wide variety of patients I encountered during the PassPACES Course really made all the difference. Taking your course 2 months prior to my exam made me realize the amount of work I needed to put in and it certainly paid off, as I was able to optimize the planning of my revision. Dr Edward Chong, MRCP, Sheffield, UK. I attended the PassPACES course as part of my preparation for the MRCPI clinical exam. The course was exceptionally well organised, with fantastic teaching and a challenging case load. An emphasis on exam technique and insights into the MRCPI marking scheme were added bonuses. The organisers were kind enough to tailor mock exams for myself and several other MRCPI candidates to meet the criteria of the Irish exam. I feel the course played an integral part in my success on exam day. I passed at the first attempt with the highest score at my exam sitting. Sincere thanks to Dr. Bessant and all at PassPACES. Just mailing to let you know I passed my PACES exam in February 2015, with full marks in Abdomen, Cardiovascular and Neurology and high marks in Station 5. I attended the PACES course in January, 5 weeks before my exam. The variety of pathology seen during the course is priceless, with patients knowing their own clinical problems. The tutors were fantastic and helpful. I found the MOCK exams really useful as they highlighted the weakness, and the areas to improve. Dr.Vinay Kumar, MRCP, Blackpool Victoria Hospital. I wanted to thank you all very much for all guidance and support at a very well organised revision course. I passed my PACES exam this summer with a score of 170/172. The PassPACES Course as well as the Pocketbook for PACES which I used as my main textbook had a big hand in this! I really would recommend both to candidates preparing for the exam. I will indeed be recommending PassPACES to all upcoming PACES candidates! Dr. Sarika Shah, MRCP, Lister Hospital, Stevenage. Firstly, may I say how excellent the PassPACES course is! It is a credit to you and I am very pleased that I chose to attend. It was very professionally organised and it was a joy to see and appreciate in the flesh so many signs that I have only ever read about in textbooks. I am pleased to say that I passed PACES at the first sitting in June, a few weeks after attending the course. Overall I think the exam was fair and I was marked in a reasonable way. I did lose marks in places - but I deserved to, and equally I was rewarded for good performance also, scoring full marks in several stations. All the best. Dr. Nicky Goodfellow, MRCP, John Radcliffe Hospital, Oxford. I just wanted to let you know that I was successful in my PACES exam. In fact, I almost received full marks, with 171 of the available 172 points and I am extremely pleased about this result. I would like to thank you again for your help, not just through the course material but also through the Pocketbook, both of which were my only resources on this second attempt. I am also very pleased as I recently had great news about getting my first choice job as a registrar, which will be in Medical Oncology at the Royal Marsden. Thanks again for your help towards this exam, I am ever so grateful! Dr. Vassilis Aggelis, MRCP, Royal London Hospital. Thank you so much for running such a fantastic course, which I and four of my friends attended in January this year - all five of us were successful in our MRCPI in February! The teaching was excellently delivered and the personal constructive feedback we received each day was very beneficial. Thank you also for focusing on the Irish long case and Irish marking schemes - it was much appreciated. I came away with the confidence to tackle almost any case that would be thrown at me! I passed my MRCPI exam two weeks after the course - and I couldn't have done it without your help! I would highly recommend the PassPACES Course to others who are sitting the membership examinations, and I have been advising my fellow Cork colleagues to attend this course! Dr. Deirbhile O'Keeffe, MRCPI, Cork University Hospital, Eire. I would like to express my gratitude and appreciation for all the guidance and support at your very well organised revision course. I passed my PACES exam on my first attempt! Who could ever imagine! The PassPACES Course was very intense, but absolutely necessary to put things right and build up my confidence. I feel my faith in medicine has been restored and I have become a better doctor for my patients. Thank you so much once again for helping me through and wishing you continued success in your work. I passed PACES on my first attempt with a score of 171/172. I am certain that without attending PassPACES that would not have been possible. Seeing so much pathology and being asked all the questions before the exam makes the whole process so much easier. I am writing to thank you and all the tutors/instructors I had the pleasure to be taught by, on the PassPACES course in February. I found out this week that I passed with an overall grade of 168/172. I was over the moon. I truly feel the PassPACES course played a significant role in my preparation and subsequent passing of my PACES examination. I attended a few courses over the stretch of my PACES revision; none came close to the level of detail and expertise of the PassPACES course, so again thank you for that. The course prepared me well, and I cannot commend the course highly enough. Dr. Joanna Lynch, MRCP, Royal Marsden Hospital, London. I attended the PassPACES course last June, and I just wanted to inform you that I successfully passed my PACES exam with a score of 167/172. I would like to thank you and the staff at PassPACES for all the help you provided. Dr. Paul Torpiano, MRCP, Mater Dei Hospital, Malta. I am writing to say what a good job I think you have done with this course. I think much credit must go to Dr Bessant for organising it all with such efficiency. I felt that the emphasis was always on the quality of education and patient welfare. The course particularly benefitted from consistent time keeping which was important to give us all a fair amount of time with each patient. A large part of the course was spent actively examining patients, rather than watching. These qualities should not be taken for granted and were not present on another PACES course that I attended. Well done - word of mouth keeps these sorts of course going and certainly everyone I speak to who has done this course shares these sentiments. I was very fortunate to have passed my PACES exam! I am so relieved to have got through first go. Perhaps a little bit of luck along the way helped, but no doubt PassPACES made a huge difference to my chances. Thanks you for your help. Now to spend a bit more time with my wife and baby over Christmas! Dr. Christopher Phillips, MRCP, John Radcliffe Hospital, Oxford. PassPACES is a great course. You will have the opportunity to learn all the skills needed to become a better clinician as well as to pass PACES. The course is very well run, and the tutors are extremely knowledgeable, but more importantly approachable. I took this course in January 2016 and passed PACES on my first attempt with a score of 169/172. Worth every penny! Just to let you know that I passed my PACES exam on the 6th of February (170/172)! Thank you so much for your help. Dr. Naina Mohan, MRCP, Croydon University Hospital. ‘I just wanted to inform you I passed my MRCPI clinical exam in June. I attended your course in May and found it truly amazing from start to finish. Without PassPACES I would never have passed. I was delighted that I attended a course five weeks prior to my exam. This allowed me sufficient time to plan and target my revision, based on the clinical teaching that I received at the course. All the cases I encountered in my exam had been taught to me at the course. I just wanted to put in writing my sincere thanks and appreciation for the last four days on the PassPACES course. The course was absolutely amazing in all ways. Every lecture relevant, every session well organised and the teaching second to none. I have never in my life experienced anything quite like the PassPACES course - I have never had such high quality teaching. I was doubting myself at the beginning of this month and I was apprehensive on the evening before the course began, but I was thrilled after every day because I was never made to feel anything but supported. The patients I met knew everything about their condition and taught me a great deal. For example, I don't think I have ever been confident about hearing AR before, but this has now changed. The teachers are all enthusiastic and supportive ... Never intimidating or belittling. I feel much more confident for my upcoming exam and I also feel I have become a better doctor for my patients. I feel my faith in medicine has been restored and feel happier about life in general. Once again thank you so much for everything, I will never forget the last four days. You are all a credit to the profession. ... I wanted to you to let you know that your course stood up to its name for me – I am now Dr Alan Kevern MRCP! I would like to take this opportunity again to sincerely thank you and your team of excellent teachers for everything you have done for me when I attended the course. I am sure I would not have passed if it wasn’t for you. Passing PACES is really the icing on the cake as the course itself was invaluable in providing excellent clinical teaching and exposure to patients with signs I will never forget. I don’t want PACES to end here though, I am very much looking forward to helping my junior colleagues and supporting them in their efforts to complete their membership. I will be thoroughly recommending the PassPACES course to everyone. Dr Alan Kevern, MRCP, Darent Valley Hospital, Dartford, Kent. Thank you very much. I passed my PACES exam by a very good margin (163/172) and have my ST3 job, so will be dual qualified in a few years all being well. I recently attended the PassPACES course from 1st – 4th June. My exam was the following day! I recently found out that I passed my exam with an extremely high score (164/172, including full marks in both the Station 5 scenarios). I have no doubt that the PassPACES course and the Pocketbook, which are both designed to improve the chances of success at the PACES exam, played a significant role in my strong performance in the exam. The theoretical knowledge, examination techniques, identification of physical signs and the non-technical skills which I have been able to develop at the course will stay with me for the rest of my career and allow me to become a better physician. The 4 days were very well organised covering all areas of the exam. The mix of patients was excellent and the different teaching styles of the lecturers were refreshing. Many thanks again to all the team. I would 1000% recommend the course. I attended your course at the end of May and I just wanted to let you know that I passed the MRCPI exam which I sat in mid-June. Your course was instrumental in my passing the exam and I enjoyed every minute of it. The focus on the Irish exam was really helpful and I will recommend it highly to any colleagues or friends who intend to sit the exam in the future. Dr. Elizabeth Smyth, MRCPI, Beaumont Hospital, Dublin, Eire. I would highly recommend the PassPACES course. Through attending this course I was able to better structure my exam preparation and revision. It taught me how to approach cases on the wards in a focused, exam oriented manner. There were a good range of cases available to examine and be taught on. One of the biggest strengths of the course was the way in which the tutors helped prepare you for strategies to cope with the unexpected cases that were complicated and not 'barn door'. When it came to the neurology case in the exam, the diagnosis was unclear, but by using some of the skills I gained on the course I was able to work my way through logically, without panicking and gave a sensible differential. I gained full marks in this case, which I would not have done prior to the course. I passed with full marks in all stations except one with a score of 170/172. I passed the exam at my first attempt, and I'm sure that this was because of the excellent teaching that you provide on the PassPACES course. The 2 other doctors from my hospital who attended the course also passed. The teachers were all really supportive and helpful, and gave great advice about how to tackle different scenarios and how to present findings for the exam. Being able to see such a variety of clinical cases really gave me confidence in the exam. During the exam it felt like I'd already seen these cases before on the course. I particularly appreciated the teaching on Neurology, Ophthalmology and Cardiology - I was dreading these stations in the exam, but they turned out to be my strongest stations. The mock exam on the final day was very representative of the actual PACES exam that I sat, and this helped me to stay calm and focused during my PACES. Once again, thank you to everyone involved with the PassPACES course which was really helpful in preparing me and getting me through PACES with a score of 153! I have absolutely no hesitation in recommending this course to other PACES candidates. Dr. Catherine Hyams, MRCP, Newham General Hospital, London. ‘We are delighted to inform you that all three of the St James' Hospital MRCPI candidates who attended PassPACES passed the Irish MRCPI examination. Drs. James Nolan, Stephanie Menzies and Cathal O'Broin, MRCPI, St James’ Hospital, Dublin. The PassPACES course is far superior to all the other PACES courses out there. It delivers teaching of the highest calibre and one would struggle to find the breadth and depth of clinical cases and syndromes in one location that is provided at PassPACES. As a previous multiple written exams failure, I passed my PACES first time with a high score, and I attribute this solely to the excellent teaching and exposure to the full range of medical patients that I had on the PassPACES course. The teaching also enabled me to refine my presentation technique - a skill very much required in the PACES exam and one that really is pass/fail. I cannot recommend this course highly enough to anyone preparing for their final MRCP. I plan to use what I learnt at this course in my everyday practice, too, as it has helped me to identify complex medical problems through the sheer skill of a detailed and considered bedside examination technique. I would like to thank Dr Rupa Bessant and each of the Brilliant team of doctors at PassPACES for all your guidance and teaching on the course which I attended in June, and which helped me to pass my MRCP PACES exam. 1) As a GP I have been out of the hospital environment for 3 years. The lecturers tailored the teaching on an individual basis within the group enabling all group members to learn from each other in a very constructive manner. The knowledge which I gained will be very useful for my future medical career. 2) I have attended many courses and I found that PassPACES compared to the other courses really represented the cases which came up in the exam. 3) All the lecturers are of a very high standard and are very enthusiastic about teaching which makes it a great environment to learn. 4) The mock exam was an excellent way to finish the course, providing a trial run before the real thing. The individual feedback received by your examiners at the end of the mock is really useful as it helps you focus on your weaker areas. Once again ‘Thank you so much PassPACES!! I'm just emailing to let you know that I passed both my MRCPI clinical and PACES! I am so delighted and want to thank you for such an excellent course. PassPACES was excellent preparation for both PACES and the MRCPI clinical exams. The quality of the teaching and the variety of cases were superb. The cases on both exams were very similar to those I had already seen on the course. I was given a chance to do mock exams in the format of both the Irish and UK exams, which was hugely useful. I'd highly recommend this course! I just thought I’d let you know that I passed PACES at my first attempt on Sunday! Very, very happy! Thank you so much for organising such a fantastic course; I really felt there was a genuine interest to make the attendees better physicians and to reach a standard which is maybe no longer expected in modern-day medical school training, or even, the NHS. When I wrote the BMJ article in September, I didn't fully appreciate the value of the comments made about the course, but I am glad this has been all confirmed! 'Choosing the right course'. BMJ Careers, 2 October 2012. P.S. 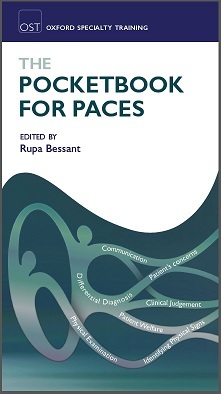 The Pocketbook for PACES is fantastic - thanks again. I would like to thank you for such an excellent and thorough course. I passed PACES on my 1st attempt, scoring a 163/172. I am sure every PACES course has a large repository of patients with excellent signs, but I believe PassPACES delivers by constantly emphasising the PACES way of thinking; whilst preparing you for the classical PACES patients (pulmonary fibrosis, aortic stenosis, etc. ), it also makes you comfortable presenting patients with multiple signs where a single diagnosis is not achievable within the 6 minute time window of the examination. Not only does this help with exam preparation, but it also prepares you for the real life scenarios you will face in the future as a registrar. Another forte, which I found particularly helpful, was the station 5 preparation and mock exams. The constructive criticism provided by the lecturers on the course led me to see patients in a 'station 5 setting' on getting back to the wards, and ultimately resulted in the achievement of full marks in both of my station 5 scenarios. Thanks again to all the doctors who taught on the course, and to Dr Bessant, the organiser. To those facing PACES - good luck, and make sure you attend this course! Dr. Mark Philip Cassar, MRCP, John Radcliffe Hospital, Oxford. I just wanted to write and thank the PassPACES team. I struggled with PACES before so attended the course and just found out I passed with a score of 161/172. The course had a large number of patients with a wide variety of conditions and we were given good advice on how to spot subtle clinical signs that could easily be missed. There were no surprises in the real exam, having examined patients on this course, but even if there had been, the course taught me how to be systematic and give an intelligent presentation and differential diagnosis. The clinical lecturers were enthusiastic and approachable. The mock exam was a good experience to practise examining and presenting in front of someone who remains expressionless (like the real thing)! The last day provided a good session where one could freely examine patients and clear up concerns with the lecturers. I would recommend the course not only to pass PACES but for one's career in general. Dr. Eleni Josephides, MRCP, Guy’s & St Thomas’ Hospitals, London. I just found out that I passed by a good margin at my first attempt. As an F2 doctor with only three months experience as a medical SHO, sitting PACES so early in my training was daunting. However, PassPACES provided me with a systematic approach to the exam and improved my self-confidence enormously. The excellent teaching and individualised feedback I received from your knowledgeable and approachable team were vital to my success, for which I am extremely grateful. I just wanted to say that I passed my PACES. This was after several attempts and without your course I don't believe I would have been successful. The advice given, the level of exposure to a wide variety of patients and especially the mock exam were all very helpful. Thank you all the lecturers. I wanted to let you know that I passed the MFOM Part 2 exam. What a relief! The course was excellent. I have never seen so much pathology in one place! A real PACES community! The teaching was very good, in the general systems overviews at the start of each day, the small group work and individually when presenting patients. The teachers were patient, approachable and helpful, informing our thought process to aid the presentation of our findings. It was daunting as I have been out of hospital medicine for a very long time, but I soon got over that! I was really grateful that you were able to offer the MFOM candidates a long case to help specifically in our preparation, which was different to the PACES exam. Thank you very much for such a great course, it really improved my confidence and "reminded" me of much I had forgotten! I would like to thank you all at PassPACES for the expert teaching and guidance I received at your course in September. Through excellent clinical teaching, a wide variety of fantastic patients, who not only had great clinical signs, but a vast knowledge of their condition, very enthusiastic teachers who gave me invaluable exam tips on how to approach even the most difficult of cases, I can certainly say this was the best medical course I have ever attended. I was given plenty of opportunities to perfect my examination technique and received personal feedback through small group teaching. I was also able to practise history-taking and communication skills based on previous exam scenarios. Whilst I was extremely nervous for the mock exam, it was easily the best way to prepare me for my PACES exam, highlighting my strengths and weaknesses and again learning through constructive criticism. As my actual exam was 7 weeks after the course I was able to structure my revision carefully and develop the knowledge I had gained on the course even further. I passed my PACES exam at my first attempt with a score of 167 out of 172, which I am absolutely delighted with! I know I would not have achieved this without attending your course. Thank you very much again for all your help and I would recommend your course to anyone sitting their PACES exam in the future. Dr. Eimear Wright, MRCP, Musgrave Park Hospital, Belfast. We just graduated with our MRCPI a couple of weeks ago. We wanted to say thanks very much for all the help received at the PassPACES course, which probably made the difference between passing and failing. We were faced by some very intimidating examiners on the day, and the mock exams really helped. Dr. Kieran Murray, MRCPI, Beaumont Hospital, Dublin and Dr. Aoibheann Flynn, MRCPI, St James, Dublin. I just wanted to let you know that I have just passed my PACES exam and I am very grateful to you and your team for the truly excellent teaching that I received on my PassPACES course. I think that you have created an exceptional course and it really prepared me well for the exam. I was very impressed at the time, not only by the quality and variety of patients that we were able to examine, but also by the high quality teaching provided by all of the facilitators. I really do believe the PassPACES Course was worth every penny, which is not something I would say of many other courses I have attended so far in my career. For example, a one day neurology PACES course: in comparison the structure of the course was much less useful and the quality of teaching was not as high and I left feeling that I was glad I had chosen the PassPACES course and not the other 2 day course that they offer. Thank you very much for putting on the course, I am sure it is a huge organisational commitment for you, but I am convinced I would not have been properly prepared for the exam without it. I will certainly recommend it to my peers. Dear Dr. Bessant and PassPACES Team. This is Jer Ming here, who joined the PassPACES course from 5th to 8th June and I am glad to inform that I've pass my PACES exam! I am indeed grateful to you all for the thoroughly enjoyable and informative course prior to my exam. There was a wide selection of cases and the examiners are very helpful and approachable! A million thanks will also not suffice for all the great work that was done by you and your team. Once again, thanks for everything! Dr. Low Jer Ming, MRCP, Kuantan, Malaysia. ‘I just wanted to let you know I passed PACES at my first attempt with a mark of 167/172, scoring full marks on all but two stations. I couldn't believe it when i received my results, especially as I'm a radiology trainee who did not have day to day exposure to patients or access to any organised teaching. I'm sure my success was due in a large part to your course. I would like to express my gratitude to you for organising such an amazing PACES course with excellent lecturers. I am writing to inform you of my success in the Paces exam. I felt that the PassPACES course was key in preparing me for the exam, in immersing me in a competitive learning environment with the opportunity to see a large number of clinical signs in a short space of time. I scored very well in the exam, dropping only two marks in total, and wanted to feedback my good news. ‘To all the Teachers at PassPACES. ‘I recently attended the PassPACES course and discovered yesterday that I had passed the PACES examination, with a score of 168/172. The PassPACES course was fantastic; amazing patients with not only great clinical signs, but real knowledge about their conditions, and brilliant tutors who clearly enjoyed teaching. I will definitely be recommending the course. I just wanted to leave some positive feedback to you post-exam. I went on the PassPACES course in January this year and passed my PACES exam in March (first attempt!). Many thanks to all the course organisers, I can safely say that this course was the difference in getting me over the finish line! I just wanted to let you know that I passed my PACES exam at the first attempt, with full marks in several stations, on March 12th. I could not have done it without the help of the course. The course was not only great exam revision but reminded me why I did medicine in the first place!!! Before I did the course I would have panicked on my neuro station but the patient with dermatomyositis and proximal myopathy at the course was great as I got a similar case in my exam. I have recommended the course to those I work with when they are practising for PACES. Thanks for the help of the whole PassPACES team! Dr. Sethu Mani-Babu, MRCP, Maidstone Hospital. I just wanted to let you all know that I passed my exam on 1st March on the first attempt! I think the course was by far the most valuable thing I did to prepare - although I was initially worried about being able to afford it, I feel it was definitely worth the fee. I will certainly be recommending it to others sitting their PACES! Dr. Hannah Carlin, MRCP, Royal Victoria Hospital, Newcastle. I am writing to inform you that I passed the PACES exam in March on my first attempt. I scored full marks in 6 out 8 stations (including neuro and communication skills), which was all thanks to the teaching and the similar patients I encountered at the course. The teaching I had received enabled me to elicit the findings in the exam with ease. The tutors provided with many useful tips which were instrumental in my success. The course material and structure was excellent. I would highly recommend this course to anyone preparing for their PACES exam. Dr Reema Jagdish, MRCP, Whiston Hospital, Merseyside. I passed PACES at the first attempt with a score of 167/172. I found the PassPACES course extremely helpful; most of the cases that came up in my exam were very similar to cases used for teaching on the PassPACES course. Having this prior experience meant that not only was I able to swiftly identify the positive signs and arrive at the diagnosis, but I was also familiar with presenting the case and fielding the examiner's questions. The course also teaches how to approach the Station 5 cases, which are harder to prepare for than the other stations. I would highly recommend this course - it was well organised, with a wealth of patients with clinical signs and expert tutors to help with presentation skills. Dr Daniel Hammersley, MRCP, Brighton and Sussex University Hospitals. Just wanted to say thanks so much for the course I attended at the end of January. I sat my exam soon after on 7/02 and I passed! I scored 160/172. Dr. Mohammed Abdul-Latif, MRCP, Whipps Cross Hospital, London. I attended your excellent course in October. I'm delighted to tell you get I passed with good marks. My success was certainly down to your course, nothing else prepared me for the reality of paces. Dr. Claire Swarbrick, MRCP, Queen Alexandra Hospital, Portsmouth. Thank you very much for all the excellent teaching that I received at the PassPACES course. I passed the exam on this attempt because of this course. I scored full marks in several stations. I had previously attempted the exam, but failed as I had just lacked confidence. I have recommended PassPACES to all my colleagues, and will continue to highly recommend it anyone who is taking the exam in the future. Dr. Sweni Shah, MRCP, Queen’s Hospital, Romford. I would like to thank you again for an excellent course. It seemed like a lot of money when paying for it, but after doing the course I had no doubt I had invested wisely. I am delighted to say I managed to pass both the PACES and MRCPI first time. Without the course I am unsure whether I would have achieved such a feat. Everyone rightly mentions the fantastic teaching but I would like to also praise how efficiently it was run, right down to the strategic tea breaks. This enabled maximum time to be assessed and see good cases. I attended the PassPACES course from the 14th to 17th of May, a month before my exam which was in Newcastle. I am very happy to let you know that I got through the PACES in my first attempt and feel very grateful to the Team of Lecturers, lead by Dr Rupa Bessant, who gave me confidence and the skills to face the exam. I am very glad that I chose to attend your course as I feel it really gives you the passport to success in PACES, especially as an International candidate from Sri Lanka. Thank you very much!! I just wanted to say thanks so much for your help in September. I genuinely don't think I had any real concept of what the PACES exam entailed before I attended the PassPACES course. It hasn't just prepared me for PACES, but I feel like, by changing how I approach clinical assessment, it has improved my clinical practice as well. I've got my results and I passed. Thanks for the preparation; and to all the tutors, thanks for the patience, encouragement and advice. Dr. Ireti Adejumo, MRCP, Nottingham City Hospital. I just wanted to thank you for the truly excellent course at PassPACES, which was worth every penny. You have assembled a fantastic supporting cast of teachers and patients! I will definitely be recommending the course to my colleagues. I thankfully passed my exam. Dr. Francis Carr, MRCP, Barnet General Hospital, London. I just wanted to let you know that I passed first attempt with a score of 155! The course was fantastic, very well organised and provided a huge variety of essential cases to see. Every case that came up in my exam, I had seen before either at your course or in practice. I wouldn’t hesitate to recommend your course to my colleagues. I thought I would let you know that I took the exam on 1st October. I'm very happy to report that I passed the exam with a very good pass. The PassPACES Course was invaluable in preparing me for the exam. I have recommended it to my colleagues. I can honestly say is difficult for me to imagine a better preparation for the exam when it comes to examination technique as well as exposure to signs etc. Many, many thanks! Dr. Ben Irving St Richard’s, MRCP, Chichester. Just wanted to email to let you know I passed my PACES exam on my first attempt! I even managed full marks in several stations...I am shocked but very happy! I attended the course 2 weeks before my exam and I had read all the reviews and been given recommendations from friends but the course was even better than expected. Thank you for organising a course that delivers excellent, high quality teaching throughout the 4 days. The wide variety of patients really helped build confidence and teach me how to focus my revision in the last 2 weeks. The PassPACES Course is probably the best teaching I have had since starting medicine and was worth every penny! Please pass on my thanks to all those involved in teaching and to the patients. Dr Sunit Davda, MRCP, Luton & Dunstable Hospital. I just wanted to say thank you for taking me through the PACES hurdle. I honestly would NEVER have passed if it wasn't for the amazing array of patients you allowed us to be exposed to over the 4 days, rather than relying on my own patient "hunting" around the wards. Cardiology was BY FAR my weakest station and I was thrilled after getting full marks after seeing so much cardiology over the duration of the course. Although my history station was difficult I still passed it by applying the basic yet reproducible skills the course taught me. Dr. Philippa Rohman, MRCP, Royal Free Hospital, London. I am emailing to say ‘Thank you’ to all the PassPACES team for the teaching I received at a recent course in September (9th to 12th). Fortunately, I passed on my first attempt of PACES, and I am glad I picked this course. Dr Bessant was great and I learned a lot from her. I hope others achieve the same success, and I will, of course, recommend the PassPACES course to others. It was full of many signs that came up in my exam. I am writing to say a BIG thank you. I have passed PACES with 164/172. The course provided a good framework for my PACES preparation, and it was exciting to be exposed to such an array of clinical cases. I will definitely recommend this course to my colleagues! I am happily emailing to let you know that I passed my PACES exam! I really have to thank you for putting together such a thorough and well-run course. It was unbelievably productive for preparing for the PACES and it framed the rest of my revising for the exam. It was definitely worth the cost of the course and I will recommend the course to anyone preparing to sit the exam. I am starting a ST3 post in cardiology at Imperial College in the autumn. Fortunately, I can start without difficulty now that I have passed the PACES! Dr. Naeema Ginwala Hasan, MRCP, Addenbrooks Hospital, Cambridge. I graduated from Sri Lanka and came to the U.K. for my overseas training. I got through the PACES exam in first attempt and this is because of your course and your book as well. I am thankful to all the hard working dedicated teachers on the PassPACES Course for their guidance and to the patients as well. This has been the best course ever in my career and I will recommend it to anybody sitting their PACES exam. Dr. Ganeshalingam Sriram, MRCP, Luton & Dunstable Hospital. I am writing to thank you for your pearls of wisdom and help throughout the PassPACES Course which I attended in May. I am pleased to inform you that I passed PACES on my first attempt in July. I cannot thank you enough. I scored full marks in all but one station with at total score of 158/172. Will recommend your course to my colleagues for sure. I hope that this email finds you in good health to teach the next generation of hopeful doctors. I just wanted to say thanks for all the help and guidance I received during the PassPACES Course. I passed on the first attempt and I'm very, very relieved and extremely happy. Dr Janice Ting, MRCP, Tameside General Hospital. Great news, I passed! First time too, and by a good margin, scoring 156/172. Couldn't have done it without the help of your dedicated team or the interesting and kind patients. Just found out I passed PACES, and wanted to thank you all again for your brilliant course - without which I'm certain I wouldn't have passed! I will be recommending it to all other CMTs! I would like to thank the course organizers for the successful conduct of the PassPACES Course, which helped me greatly in passing MRCP. Having attended multiple PACES preparatory courses prior to the PassPACES course, I dare say that your course is one of the best I’ve attended. The course was intensive and targeted, the organizers were incredibly experienced and the patients were very knowledgeable with regards to their condition. I was pleasantly surprised by the extensive variety of cases available to us. I left the course feeling ready and prepared for the June PACES diet, and sure enough, I passed on my first attempt. PassPACES was an absolutely fantastic learning experience, for which I am very grateful. I will certainly recommend the PassPACES course to all who wish to pass PACES. Dr. Tan You Jiang, MRCP, Singapore General Hospital. I attended the PassPACES course in May and I'm very pleased to let you know that I passed my PACES exam in July. I thought the course prepared me really well and I enjoyed it very much. As far as I've heard, all members of my small teaching group at the course have passed too. Thank you very much for all your hard work. Dr. Janani Jayawardena, MRCP, West Suffolk Hospital. I just wanted to let you know that I passed the MRCPI clinical exam. The PassPACES Course was fantastic! It was extremely well organised and made all the difference for me on exam day! Dr Bessant and her team were outstanding. I attended the course three weeks before my MRCPI exam and I felt it gave me enough time to put what I had learned into practice. During the course I saw examples of all the cases I had in my exam. I wouldn't hesitate in recommending this course to anyone, as it is thanks to PassPACES that I was successful on my first attempt. I just wanted to let you know that I passed (158) ! Thank you for all your advice and for having me on your incredibly well run course. I have told every medic I know that they must do your course. I actually wish I had done it a couple of years ago as I feel it has made me a better doctor. The skills I learnt and seeing the patients that you presented to us have without doubt improved my clinical abilities. Your course is what medical school should be like. I wish you could take over my training programme - I'm sure you would make it a much more efficient and valuable experience! Thank you again for your thoroughly enjoyable course which prepared me extremely well for the exam. Dr. Helen Collyer-Merritt, MRCP, Worthing Hospital, Sussex. I am delighted to inform you that I have passed my PACES examination on first attempt with full marks in most stations, and with a score of 169/172! I am really relieved and grateful to you all for all the help and amazing teaching that I received during the June PassPACES course. You are all brilliant at what you do. Your excellent course is well structured and truly reflective of the exam. The course gave me the final boost to pass PACES on my first sitting. Thank you again for your help and encouragement. Dr Farah Latif, MRCP, University Hospital of Wales, Cardiff. I just wanted to drop you a line to let you know that I passed the FRACP (Fellowship of the Royal Australian College of Physicians) examination. The turning point in my preparations was the PassPACES course and the shear variety of clinical cases boosted my knowledge base and instilled a much greater confidence in me. I particularly liked how patients gave feedback on our clinical skills at each station and their personal insight (and passing tips) was golden. The clinical lectures were stimulating and relevant. I am highly recommending the trip for next year’s cohort. Dr. Eoin O'Dwyer, FRACP, St Vincent's Hospital, Sydney. The PassPACES course was excellent. The quality of the teaching was fantastic, with a huge range of patients with varying clinical signs. The faculty were all very professional, and each offered their own specialist take on the examination which was perfect preparation for each of the clinical stations. Moreover, beyond preparation for the exam, PassPACES has equipped me with skills and approaches that I use in my daily clinical practice, and made me a better doctor for it. Dr. Stefano Palazzo, MRCP, Addenbrooke’s Hospital, Cambridge. Hope you are well. I sat for the PACES in October and Passed! Thank you all so much for the targeted teaching and the excellent array of cases you arranged to show us. This was my first attempt and being a relatively new UK doctor, and an overseas medical graduate, it could not have been possible without your course. I always treasured the words you said on the last day 'Dr.Hakim, You have it in you. You will pass.’ Even though I failed your mocks, I learnt from the feedback of Dr Ford, and prepared myself better because of that. Your words had also given me the confidence I would have otherwise lacked. Dr. Rubyyat-A (Ruby) Hakim, MRCP, James Cook Hospital, Middlesborough. I wanted to pass on my sincere thanks for your excellent PACES preparation course. I attended the course in early September in London. I sat the MRCPI examination in early October and passed the examination at the first attempt which I am thrilled about. I have advised my fellow Irish candidates of the course. Just to let you know that after having attended your course in October, I then successfully passed my PACES exam in Birmingham! Thank you for a brilliant course. It is obviously very useful for the exam, but generally a great course for brushing up skills and knowledge. I would recommend the PassPACES Course to anyone - doing PACES or not! Dr Tanya Bainbridge, MRCP, Southampton General Hospital. Thank you for your amazing course. I just wanted to let you know that I passed PACES with a score of 160/172, and have now finished MRCP(UK) exams. This was not my first attempt but definitely my most confident thanks to your excellent course. My colleagues and I are very grateful to you and your experienced team. I will make sure to recommend your course to all my colleagues. I am from the Singapore contingent from the September PassPACES Course. I am pleased to inform you that all 3 of us practising at my hospital (myself, Lim Lee Yen, and Tay Sok Boon) have successfully passed the exam. Thank you for organising this very well run course, which provided a good range of cases with classical signs that we do not often see in the wards. Preparing for Paces forced me to integrate clinical experience and knowledge and the course came at the right time to help me consolidate what I have studied. I am sure future participants will benefit as much as we did! Dr. Yinghao Lim, MRCP, National University Hospital, Singapore. I attended the Pass PACES course in September. I found the course incredibly useful and just wanted to let you know that I passed my exam with a score of 169/172. We would like to give you the good news that we both passed our PACES exams in Singapore! The PassPACES course is excellent at delivering good teaching in a short period of time. The tutors really gave very good tips and comments on our examination technique and presentation skills, which I thought was truly helpful towards our preparation for the examination. There were a wide variety of patients with different conditions at the course, which provided fantastic revision for the PACES examination. We are so happy that we attended this course, without which we may not have been able to pass the examination first time round. I'm thrilled and relieved to be able to tell you that I passed my PACES exam, scoring full marks in most of the stations, including both Station 5 cases. Many of the things I learnt on your course helped for the exam. I found the PassPACES course a really fantastic experience. It was a privilege to meet patients with such a range of diseases, who were so happy to share their experiences and even give us advice on examination technique and tips on how to do well in the exam! Dr. Antonia Timmis, MRCP, St George’s Hospital, London. Thank you so much for all your help and teaching on the January course. The course was incredibly well run and really enjoyable. The standard of teaching was excellent and the patient cases very comprehensive….I had seen every case that I got in my exam on the PassPACES course! Both my sisters and I have attended your course and all passed PACES first time as a result! (I scored 168/172). I have already recommended your course to my colleagues. It gives me great pleasure to announce that I have passed both MRCP(UK) PACES and MRCPI clinical exams on my first attempt! I must say it’s all thanks to the guidance and encouragement at your course that I was able to fly through the examination stations. The course highlighted my weak areas, allowing me to focus my revision according. I really think that your course was the sole reason for my success in the final chapters of the membership exams and for that, you have my utmost gratitude. Also, I just wanted to say that you were such a great motivator and a teacher that I felt like a better doctor every time I left the doors of the teaching premises after each course day. I passed MRCPI after attending the PassPACES course in London. The course is really amazing with a fantastic and friendly group of tutors. I would especially like to thank Rupa Bessant. She is making extraordinary efforts in arranging the course and helping candidates passing the MRCP/MRCPI throughout the world. Personally I think it would have been impossible for me to pass without attending this course. I am highly recommending the PassPACES course to all my junior colleagues around. Dr. Rahim Khan MRCPI, Galway University Hospital, Ireland. I just wanted to let you know that I passed the MRCPI. I am now preparing to continue in Dermatology and wanted to thank you for a really focused and well organised course. Aside from that, I also really enjoyed the course material. It was incredibly motivating & the teaching was excellent. I would also have to commend the patients who were extremely dignified and taught us a thing or two! I would have no hesitation in recommending this course to anyone doing the MRCP. Wishing you and your team the very best. I am happy to report that I passed PACES exam on this occasion! May I pass my particular thanks to Dr Rupa Bessant for organizing the perfect structure of this PACES course, inviting the teachers of top level, and bringing all the variety of typical cases! Having attended several courses, I agree with the opinion that it is the best course to prepare for PACES and gives a high chance to pass the exam! I found a mock exam very useful, and believe that it helped me to get a high mark on the station 5 in my exam. I do recommend this course to my colleges. Dr Marianna Selikhova, MRCP, University College London Hospitals. I have recently found out that I passed the PACES examination at my first attempt with a mark of 163/172, scoring full marks in several of the stations, including both Station 5. I wanted to thank you so much for the course as it really helped me with so many of my sessions. The station I was most apprehensive about before the exam was Neurology. During my exam I walked in and performed the initial screening test on the upper limbs that we were taught at PassPACES and saw that the patient had proximal weakness. Before proceeding I made a point of asking the patient to turn around and inspected for winging of the scapula - which he had! I thought back to the patient I had seen in PassPACES with this condition and was able to elicit all of the clinical signs and present my diagnosis of fasciscapulohumeral dystrpophy with confidence. I scored 100% in that station. Thank you for your fantastic course, it made such a huge difference to my result! I got my results this week and have passed PACES. I wanted to thank you for your help with preparation, through the PassPACES course. Doing the course was probably the single most useful action I took in preparing, and helped focus my revision on areas where I needed to improve. Dr. Sanjay Budhdeo, MRCP, Addenbrooke’s Hospital, Cambridge. I have passed the PACES exam in Hong Kong at my 4th attempt, after taking the PassPACES Course in January! The cases I encountered were very difficult on the exam day but I am glad that I gained enough skills through the course to pass it. I wish to thank all of the staff for organising this practical and useful course. I will recommend this course to my colleagues in Hong Kong! Dr. Hiu Ming Wong, MRCP, United Christian Hospital, Hong Kong. I'm just writing to say thank you so much - I passed PACES, with full marks in several stations, which I can't quite believe! I attended the PassPACES Course in February, and I’m sure that without the PassPACES Course and the Pocketbook I wouldn't have been so successful. I really enjoyed the PassPACES Course, not only for the sheer volume of patients and signs it allowed me to witness, but also because of the approachable and knowledgeable lecturers who themselves were so passionate and inspiring (especially Dr Charlotte Ford and Dr Fink). The entire PACES process has also reminded me how much I enjoy clinical medicine and teaching others. Once again, I wanted to say thank you very much for your teaching and guidance. Dr. Sumeet Hindocha, MRCP, St Mary’s Hospital, London. Thank you for all your help on the course. It was an excellent course and I have been recommending it to my colleagues. I scored 93% and I have every certainty that this was in part due to the high quality of teaching provided on your course. Dr. Karen Sayal, MRCP, Addenbrooke’s Hospital, Cambridge. I wanted to thank PassPACES for a fantastic course that really helped me in my preparation for my PACES exam. I passed with a score of 170/172. The high intensity of patients with signs and the useful tips we were given along the way were all great. It was particularly helpful in my neurology station in which I had a patient with myotonic dystrophy but with subtle facial signs. I started with my screening tip that I learnt from the course, got my answer straight away and smiled to myself (on the inside) as I went through the rest of the exam! Dr. Jemima Finkel, MRCP, Newham University Hospital, London. I am glad to say that I passed PACES exam. I want to thank you all from the bottom of my heart. This course has immensely helped me especially during the stress of the exam. The variety of cases, a lot of clinical signs, very well structured program all deserve double thumbs up. I have attended other courses but none of them stand up to the PassPACES course. I think the wonderful thing about this course is that you get to examine all the patients yourself. Dr. Aarthi Surendran, MRCP, Darent Valley Hospital. Thank you for your help! I happy to say I passed on the first attempt (with full marks on most stations)! Before taking the course I was really unaware of what was expected for PACES. Improved my clinical presenting with very constructive direction from seniors. The mock meanwhile put me in the PACES mental state before the real thing. Having taken your course I felt comfortable, unafraid of the eye, and really relaxed and ready on the big day. I have readily recommended your course to anyone who asks! Your dedication really comes through in the high standard of teaching. Dr. Ronit Das MRCP, DHMSA DPMSA, Nottingham. ‘Just to say thanks very much for a fantastic course. It made such a difference to me passing the exam in August. The PassPACES course increased my confidence and provided invaluable preparation. The cases were very close to those I encountered in the exam, and some of the questions I was asked were exactly the same! Dr. Anna Forbes, MRCP, Hammersmith Hospital, London. We would like to say a great BIG THANK YOU to all the PassPACES tutors for helping us to pass our exam. We attended the course in early October in preparation for our PACES exam in Singapore. We are very happy to tell you that we both passed, and this is without a doubt, largely contributed by the team at PassPACES, the fantastic tutors and the knowledgeable patients. The patients were fantastic tutors themselves, showing us the signs that we missed initially. The tutors showed us how important it was to take a step back and inspect thoroughly. A great learning opportunity which we strongly recommend to anyone who plans to do PACES. Dr. Newman Cheng, MRCP and Dr. Chiang Jianbang, MRCP, Singapore General Hospital. I wanted to inform you that I passed PACES and to thank you for your all your help. I believe this is a fantastic course and, as well as being a vital aid for passing PACES, I see it as an essential part of one's training as a physician. I believe I will benefit from having attended this course for years to come. It would take months of travelling wards and attending clinics to see the vast and varied constellation of clinical signs condensed into the course. The teaching is of the highest standard and is delivered by specialists who are enthusiastic about medical education. Dr. Philip Coakley, MRCP, Homerton Hospital, London. ‘The PassPACES course was very well organised. I liked the structure of the course, with an early lecture on the subject of the day, followed by seeing a huge volume of interesting patients with excellent clinical signs. The patients were so well-informed about their conditions and even helped us to elicit their signs! The tutors were excellent - friendly, knowledgeable and approachable, teaching things simply and effectively in small groups. They stretched the group’s knowledge and guided us through unusual conditions. Thank you for running such a brilliant course. With only 5 weeks to revise for the exam, your course was a significant and pivotal part of my practical and psychological preparation. Thank you to the tutors whose tips on technique, along with their wisdom and enthusiasm for their specialities was inspiring and insightful. The opportunity to see such a variety of patients with fantastic signs and unforgettable histories was certainly fundamental to my first time success. ‘Just a quick email to say thanks a million for the course. I'm sure you have heard it a million times but just to reiterate, it was an extremely well run, professional course, with an extremely motivated group of enthusiastic specialists. The set up was perfect, focused on the important aspects of the exam, and highlighted the areas that I needed to cover in more detail myself. In a move that has shocked no one more than myself, I've managed to pass the MRCPI, and genuinely don't think I would have been successful without the course. Every lecturer I met was clearly passionate about their chosen field and that made a huge difference. Special mention has to go to those mock short cases which were an invaluable experience, so thanks for the push! Dr. Osmond Morris, MRCPI, St James’ Hospital, Dublin, Eire. I am writing to express my gratitude for your time and efforts in organising such an informative and educational course. I have recently passed my PACES on my first attempt scoring 160 / 172. A large part of my ability to achieve this came from the succinct key messages, which were easy to remember, the systematic approach that I learnt from the course, and the experience I gained through such a variety of patients. Indeed the history station in my exam was the one that I had practiced on the course. I was delighted to have passed my PACES at this stage in my career as a CT1, which provides me with more freedom in strengthening other areas of my experience in preparation for the next stage of my training. I would also like to add that the course not only taught me skills in passing exams, but also lifelong clinical acumen, including methods and structures in the examination and management of conditions seen in both acute and chronic settings. I thoroughly enjoyed the course. Please do forward my appreciation to the tutors. Thank you again and I wish you continuous success in benefiting the next generation of clinicians like myself - I will certainly recommend this course to my colleagues for many years to come. Dr. Simiao Liu, MRCP, St. Georges Hospital, London. The PassPACES Pocketbook had become my bible coming up to the exams - the amount of information contained in that concise small book is invaluable! The first thing to say is that I have passed the exam (scoring 164/172)! I am really grateful for the extensive, thorough and sometimes gruelling preparation that the PassPACES course offered in terms of attention to detail, presentation skills and, perhaps most importantly, station 5. Nothing prepared me for the real thing as much as the mock test, which was powerful in its ability to replicate the PACES examination, not only with respect to patients and clinical signs, but also in terms of the psychological challenge that nervousness presents, which one must learn to master on the day of the exam! Dr. Prarthana Thiagarajan, MRCP, Queen’s Medical Centre, Nottingham. I attended your PassPACES course this year. I just wanted to let you know that I did pass PACES, with a score of 166/172. I had not done medicine for many years, as I am an Emergency Medicine Trainee. This also meant that I had relatively little ward based teaching. So I would like to extend my thanks to you for your tutoring and encouragement. Please also thank the many consultants and registrars on the course who gave excellent guidance on how to examine quite complex patients, and good feedback on how to fine tune examination and history/communication skills, both throughout the course and during the mock. I've just found out that I passed my exam with a score of 153/172. I am delighted, and very grateful for your course, without which I don't think I would have passed. I had a thoroughly enjoyable four days, during which an impressive number of cases and breadth of material was covered. Coaching from both tutors and expert patients helped take my clinical skills to the next level. As a GP trainee, only a couple of months out of foundation training, I was daunted by the prospect of the exam, but PassPACES gave me confidence and a targeted approach to preparation. Many thanks for organising the course. I'm delighted to say I passed on my 1st attempt. I'm certain this was in no small part due to your course. I got a score of 164 which is testament to the structure of your course and the hard work of the tutors and patients who kindly agreed to take part. ‘I would like to convey my sincere gratitude to the PassPACES team. I attended the course because every successful candidate that I spoke to had gone through the rigorous but well prepped PassPACES course. Dr Tim Mogga, MRCP, GPVTS, Maidstone and Tunbridge Wells Hospital, UK. ‘Many thanks for your wonderful course. I'm very pleased to say I got through on the first attempt, not bad for someone just starting CT1! Thanks of course in a large part to you. I especially found the course useful for laying out how to approach stations, working on timing and presentation, as well as how to ensure I can give a good differential and a coherent presentation after just six minutes examination. I also thought that the course was very useful for station 5, which I felt most ill-prepared for and did not really know how to approach beforehand. ‘I would highly recommend the PassPACES course to anyone sitting for the MRCP PACES exam. The quality of the teaching is first-class; the lecturers are experienced and provide comprehensive teaching, covering all that you need to know for the exam. The best feature of this course, compared to other courses, is that the teaching sessions are carried out in small groups. I was 33 weeks pregnant when I sat for my exam. I was definitely not in my best shape and did not expect to pass. This pre-exam course gave me the confidence I needed to perform optimally in my exam and I passed on my first attempt. Dr SP Tan, MRCP, Homerton University Hospital, London, UK. ‘I am from Singapore and I attended your course in May this year. I am glad to announce that I just passed the October PACES, at my first attempt! ‘I passed PACES on my first attempt and want to extend a big thank you to PassPACES for their amazing course that went a long way to ensuring my success. I felt that PassPACES course consolidated the knowledge I had already acquired through private study. The number and diversity of clinical signs was astonishing, and very representative of the actual exam. It was an intense 4 days with lots of information, but it was run very well with meticulous timing - no coffee breaks were missed! The teaching structure was very conducive to learning. There was a demonstration for each of the four systems with helpful tips and advice. The mock exam was good for experiencing the intensity and format of the exam and for identifying weaknesses. Particularly useful was having a single examiner for all 4 clinical stations so that he could establish trends in weaknesses and give personalised feedback and advice based on this. My examiner told me I needed to improve my presentation skills and I therefore focused on developing these over the following weeks, which I am certain helped me pass my PACES exam. I have also found that my improved examination and presentation skills have enriched my day-to-day performance as a clinician. I would highly recommend this course to every PACES candidate. I attended the first PassPACES course of this cycle and I thought you'd be very gratified to know that I passed my exam! The course played a massive part in that, in helping me understand how to approach the exam and to extend what I said and thought. I even managed full marks in abdo and, surprisingly, neuro. ‘I wanted to express my gratitude to all involved with the PassPACES course. I was lucky enough to pass the exam at my first attempt and PassPACES was instrumental. More than just patients with signs (although the patients and their signs are fantastic) the quality of teaching and feedback around assessment of the different pathologies allowed the maximum to be gained from each clinical encounter. This is achieved by creating a professional "exam style" environment while candidates examine, backed up by lecturers who are supportive, love their subject and are genuinely interested in helping others to improve. The sense one gets is that the teaching is tailored to individual needs allowing everyone to get the most from their time at the course, culminating in a mock exam in which an individual lecturer gives specific relevant feedback. ‘I sat my PACES exam in June and passed first time with a score I could only have dreamt of before PassPACES! The course is especially well organised, with clear instructions provided in advance. The Course Tutors were very knowledgeable, with some excellent tips for 'on the day' issues and how to look slick and confident under exam pressure! However, the big plus - patient selection! So many expert patients willing to hand over valuable tips on how to elicit some of their rarer signs and maintain patient dignity at the same time! We must have seen just short of 150 patients in 4 days! It was also my one and only exposure to Myotonic Dystrophy outside of a text book, for which I am especially grateful! Dr Joanne Evans, MRCP (UK), D.Phil (Oxon. ), CT1 Newham University Hospital, London, UK. ‘Thank you so much for organising this excellent and intensive four day course, which completely consolidated and refined my revision for PACES. The PassPACES Course propels you forward and equips you, so that when it comes to the exam, you have that little bit extra to make you stand out. I think the quality of the lecturers and their teaching was excellent, which meant that when I got to the exam I knew that even if I didn't get the diagnosis, I could at least have a sensible discussion with the examiners (which is exactly what happened on a couple of occasions). I passed, achieving 100% in some of the stations. Dr Priya Patel, MRCP, CT1 Acute Medicine, Northwick Park Hospital, London, UK. 'I recently passed my PACES exam first time around after going on the PassPACES course. PassPACES gave me an excellent feel for the standard required in the exam and provided a framework to base my revision around. By the end of the course, I was picking up subtle signs that I would never have seen before. It was especially good for me, because I was working in A&E at the time, with precious little time to revise. I'm glad I attended the earlier course in the block, because it gave me plenty of time to practice and get myself to the standard required. The atmosphere on the course was very friendly - the faculty were superb and very approachable. Dr. David Palmer, MRCP, Mersey Deanery, UK. ‘I would just like to say a huge thank you to you all for such a superb course back in May... I am recommending you to all my friends and colleagues preparing for PACES. The course was brilliantly organised, the teaching and the quantity and quality of cases to see was exceptional and I thoroughly enjoyed every day, learnt so much and came away feeling totally inspired - it was just brilliant. And you really do prepare us to pass the exam!! I have just passed PACES first time with a score of 167/172 and absolutely cannot believe it!! I have no doubt that PassPACES was key to my success. ‘I cannot recommend PassPACES highly enough. I attended the course 5 weeks prior to taking the exam and subsequently passed, achieving 100% in half of the stations. The course was excellent for so many reasons. It provided high quality medical tuition and exposure to relevant patients. Most importantly, there was a strong emphasis on putting candidates in the 'PACES frame of mind'. This was essential for me as I am a 53 year old GP, with three young children. I work in a rural Practice 40 minutes from a hospital and as a result had no opportunity for tuition or ward teaching. The final mock exam and feedback on the course highlighted personal areas requiring attention which was invaluable. The course was intense, but one never felt intimidated. There was always the opportunity to ask (sometimes very basic) questions without fear of embarrassment. ‘I wish to thank you for a wonderful course. I am from Pakistan, so had very little exposure to the sort of patients that appear in the MRCP exam. I must say the course was the ideal tool to improve on my competence as well as confidence. I just got my result and I passed with flying colours, which I honestly believe it had a lot to do with this course. During the course there were quite a few instances in which Dr Bessant grilled me like I have never ever been grilled. Truth be told I had nightmares :) Having said that it was those very instances that got me the result I so wanted. P.S. The Pocketbook for PACES was the only book I read for the exam. Top notch. ‘Thank you once again for such an excellent course. It looked to me like a massive undertaking to arrange something like this for 4 days, and to make sure everything runs smoothly - very impressive indeed. I just wanted to say that this course gave me something special - a belief in myself. I started seeing the light in the end of the tunnel and realising that I CAN be logical and calm and make sense of what signs I elicit. With this realisation in mind, I am now in a much more positive frame of mind, which will allow me to give it my best shot in 10 days! …. Dr. Sanjay Chotirmall, MRCPI, MRCP(UK), Dublin, Ireland. Dr Lou Wiblin MRCP, Durham, UK. Dr Victoria Beasley MRCP, St Mary's Hospital, London UK. ‘The PassPACES Course contributed significantly to my success in the PACES exam, which I passed on my first attempt. It is a very well organised course, with enthusiastic lecturers, who have excellent teaching skills. Each candidate has the unique opportunity to be exposed to a wide variety of clinical cases, some of which are quite rare and extremely interesting. ‘I just wanted to drop you a line to say thank you again for organising an excellent course. I am pleased to say I passed, with a really good mark of 93%, and I am sure the intense revision PassPACES provided was the sole reason I did so well. Dr. Andrew Dawes, MRCP, North Middlesex Hospital, London. ‘I just wanted to drop you a line to say thank you for helping me pass my PACES exam (first time round!). The PassPACES course was just what I needed, with a great selection of not only patients and signs but also doctors teaching on the course. You should be very proud of your course. 'I'd just like to say a big thank you to Dr Rupa Bessant and all the other course lecturers who taught me on the PassPACES course in June. The course was superbly organised with some fantastic, friendly and enthusiastic lecturers and patients with really interesting clinical signs. I've attended other courses, however this is by far the best and I've been highly recommending it to other colleagues. It has taught me so much more about clinical medicine than simply passing the exam. Without doing this course I'm sure I would not have passed first time. ‘I am pleased to inform you that I passed my clinical MRCPI exam in October. It wouldn't have been possible if I had not attended the PassPACES course. My sincere thanks to you & your excellent team, who helped to build my confidence, especially for the long cases. I have told my colleagues that the PassPACES course is also highly recommended for the MRCPI format. I found the Pocketbook of PACES immensely helpful in preparation for long cases. Dr. Nitish Marathe, MRCPI, Kerry General Hospital, Eire. ‘I just wanted to drop you a line and say how much I enjoyed the course. I thought that it was extremely well organised and packed with great teachers and patients. It obviously did the trick because I passed, so thank you very much to all involved especially Dr Bessant who obviously puts a lot of hard work into this course! Dr. Emily Akufo-Tetteh, MRCP, Bristol Royal Infirmary. I have passed my PACES! I have been to many PACES courses and your course is definitely very different. It tuned my skills and knowledge in such a fine way and equipped me to encounter the most unexpected case in PACES. ‘Hello. I have done PassPACES course in October and I am very pleased to say that I passed my exam with a very good score. I scored full marks in several stations, including both Station 5. I really liked the way course approach the PACES. I have done various courses in past, but unlike PassPACES, others focus too much on diagnosis. I believe PassPACES helped me in polishing my clinical skills. I will recommend this course to all PACES candidates. Only thing you need to do is to listen and follow advice given at course. It is really worthwhile. Dr. Manish Kushe, MRCP, Liverpool Royal Infirmary. 'I just wanted to say a huge thank you for your help and guidance on the recent PassPACES course. It was such a good environment for learning and developing. All we wanted to do was stay on the course until the day of the exam. Dr. Andrew Furness, MRCP, Royal Surrey Hospital, UK.